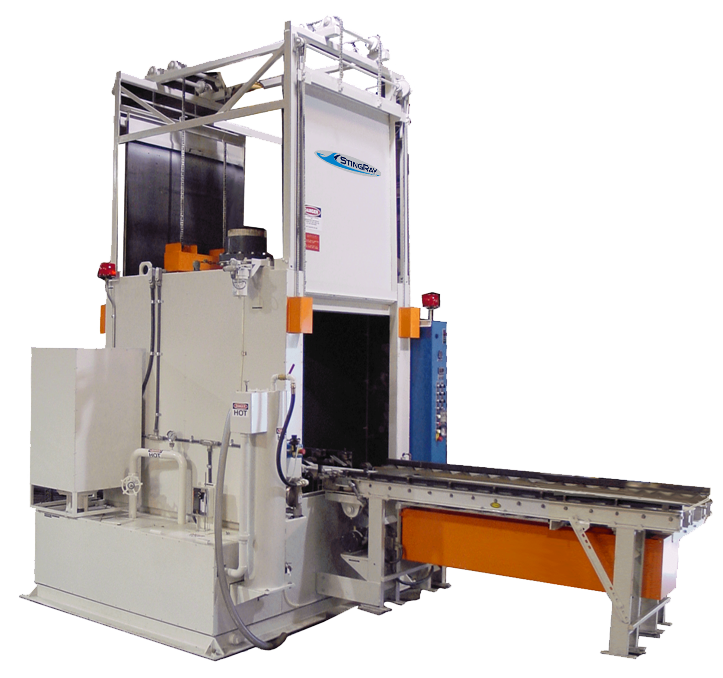 The StingRay Parts Washer is a feature rich industrial parts cleaning system. Enclosed in a steel or stainless steel cabinet, the aqueous based washer cleans in automatic cycles. 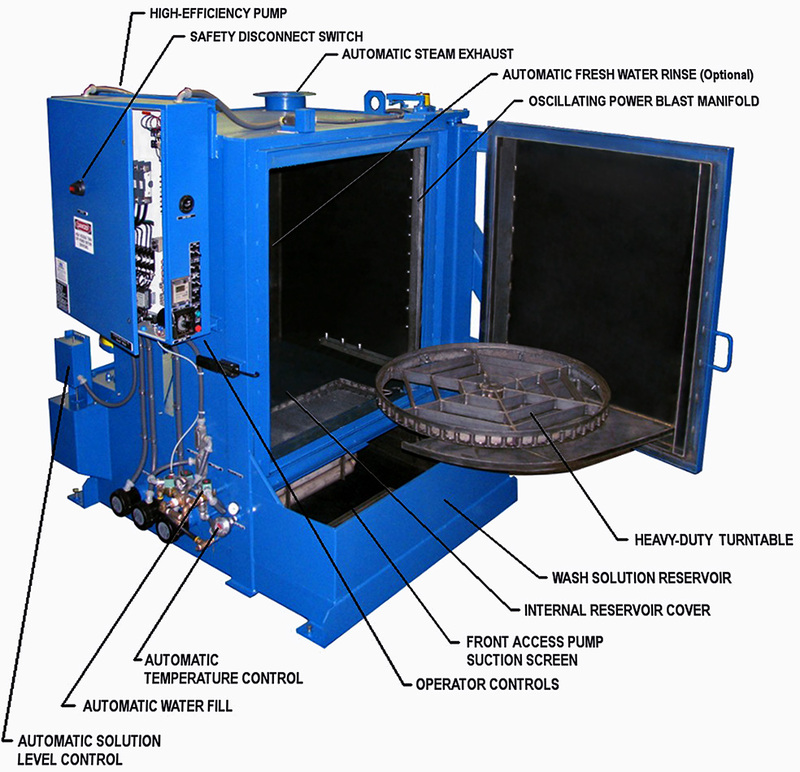 The parts wash load is placed on a powered turntable that retracts fully from the enclosed cleaning cabinet when the door opens. The pump system forces solution through oscillating nozzles that blast the parts load from continuously varied angles of attack. Completing the parts washer are the solution level management system, temperature controlled solution heating system, pump suction filter, safety devices, and single point connection electrical system. 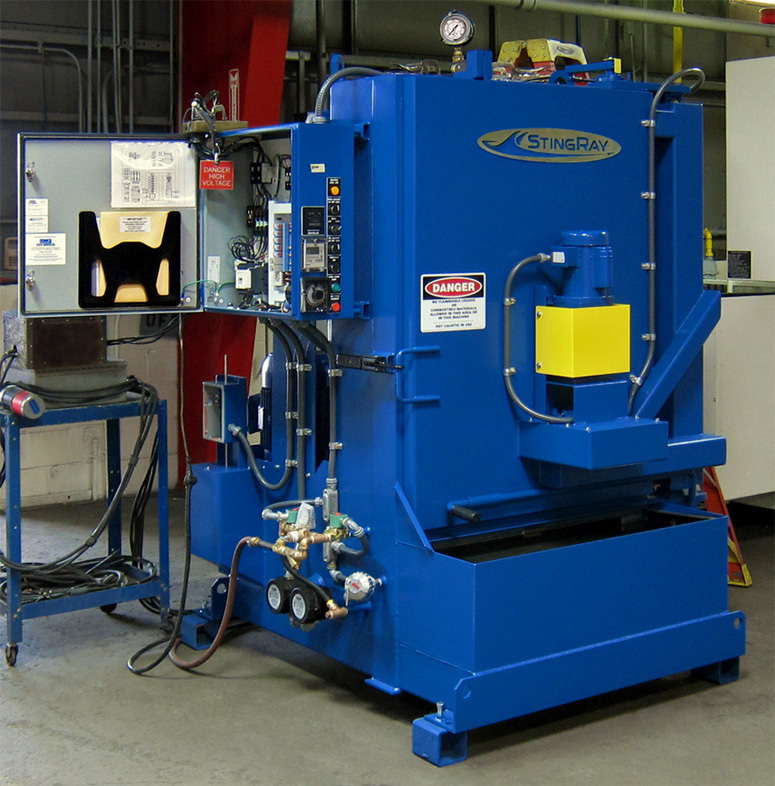 Optional rinse, steam exhaust and blow-off cycles are easily included per your needs. A number of optional solution maintenance devices – oil skimmer, sludge scraper, surface scraper, in-line filtration extend solution life. 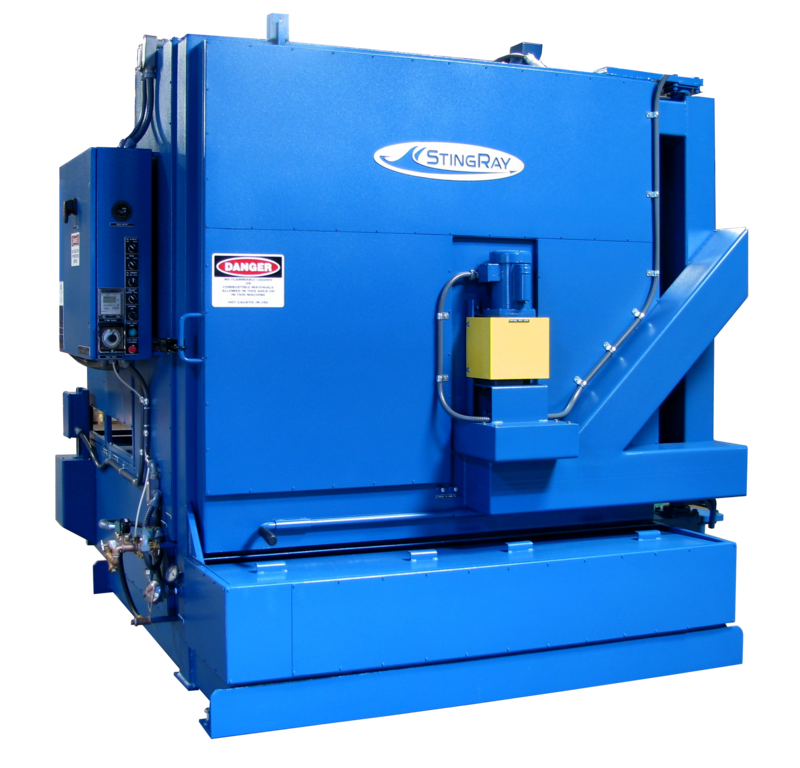 The StingRay Parts Washer is environmentally safe with a closed-loop, zero discharge design to meet EPA, OSHA regulations and Green Technology. PUMP SYSTEMS: All StingRay Simplex and Duplex Pumps, 20 horsepower and larger, are high efficiency Industrial Grade centrifugal without metal-to-metal contact in the wet end, rated for continuous duty and multiple starts, vertical mounted seal-less design, with impellers capable of passing 1/2 inch solids and balanced to within .0074 inch ounces/ounce, hardened steel pump shaft sleeves and hardened stainless steel throttle bushings, and bearings rated for 50,000 hours, Barrel style Motor-to-Pump mounting and flexible coupling ensures positive alignment and reliability without periodic adjustment. No bearings in wet end of pump. 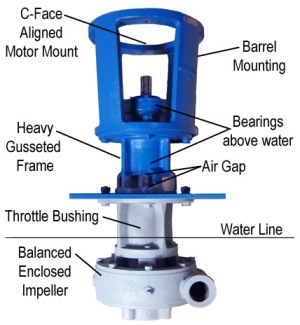 Bearings are outside of pump reservoir and include an air gap with seals to prevent solution migration up the shaft and into the bearings. PUMP MOTORS: TEFC with Class F Insulation and NEMA MG-1 Rated, with 1.15 to 1.25 Service Factors, Ball bearings, continuous duty Industrial Grade and rated for 20 starts/hour without overheating. PUMP SUCTION STRAINER: Perforated 16 ga sheet steel strainer, located at front of machine reservoir for ease of service and cleaning, designed for 2 times rate flow at 50% plugged condition. SUCTION STRAINER: Pore size of Pump Suction Strainer is slightly smaller than orifice diameter of nozzles, so particles that pass through the Suction Strainer will also pass through the nozzles to minimize clogging. SPRAY MANIFOLD: Patented oscillating manifold system blasts from the top down, bottom upward, and across the cabinet. As the wash load rotates, the Manifold oscillates on its vertical axis, making a 40-degree sweep and return every 15 seconds, throughout the wash cycle. (VIDEO) Movement of the Manifold is not synchronized to rotational speed of the turntable so each surface of wash load is blasted from a different angle each time it passes the Manifold. System is driven by a TEFC gear motor with heavy-duty crank arm linkage system featuring mono-ball bearing construction for long service life. Unions or flanged connections make servicing easy. NOZZLE SYSTEM: High impact stainless steel machined V-Jet and “0” degree patterns, aimed and spaced for overall coverage and set so each nozzle blasts on its own plane and cannot intersect with, or deflect, other nozzles in system. TURNTABLE & DRIVE SYSTEM: A heavy steel turntable on sealed bearings is driven by a thermoplastic sprocket that positively engages the turntable teeth to prevent slippage. The sprocket is powered by a TEFC gear reduction motor with steel gears and ball bearings mounted externally of the wash cabinet. The drive system is protected by a clutch overload for reliability and long service life should the turntable jam from parts that may fall. The turntable is constructed of heavy bar steel with hook and eye attachments and a rim that provide for easy anchoring of part wash loads. CLOSED LOOP CLEANING - ZERO DISCHARGE: During cleaning cycle no cleaning solution discharges cabinet for treatment or disposal. Complies with Federal goal of Waste Minimization and Green Technology. AUTOMATIC WATER LEVEL SENSOR: Electronic system with large diameter stainless steel float ball, reads solution levels. OVERFLOW PROTECTION: Shuts off water fill to prevent flooding of shop. LOW SOLUTION SHUTOFF: If incoming fresh water service is interrupted, disables heat source to reduce fire hazard, and disables Pump System to prevent damage. AUTOMATIC WATER REFILL: Maintains solution at nominal operating level. ELECTRICAL POWER: 230VAC or 460VAC 3-phase 60 Hz with 120VAC single-phase transformer for controls. Other voltages are available in 60 Hz and 50 Hz. ELECTRIC OR STEAM HEATING SYSTEM: Sized per machine reservoir volume to provide maximum 2-hour heat-up and 185°F (85°C) operating temperature. ELECTRICAL CONTROL SYSTEM: All electrical components are UL Listed and designed to meet ANSI/NFPA-79 Electrical Standard for Industrial Machinery. All wiring runs are encased in flexible conduit and sealed with moisture proof seals and fittings inside of NEMA 12 Panels, junction boxes and electrical devices. A transformer for single phase control power is mounted in a separate enclosure to reduce heat in the main electrical panel. The wire is 14 gauge THHN stranded industrial grade throughout the system. All operator controls are identified by an engraved name plate corresponding to the wiring schematic diagram. 7-DAY PROGRAMMABLE ELECTRONIC CLOCK: Programmable dual channel Clock to preheat Power Washer only during normal wash days. Has override feature to operate Power Washer on normal off days. Provides automatic timed operation of optional Oil Skimmer. 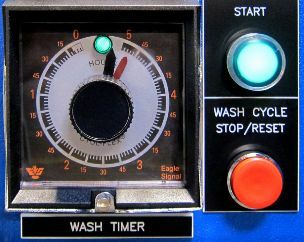 WASH CYCLE TIMER: Heavy Duty Industrial Eagle Signal timer with large easy to change adjustment. 0-30 minutes in 1-minute increments. Automatically resets to last wash time setting. Bayonet release quick change plug and play housing. DOOR SAFETY INTERLOCK: Automatically shuts down Cleaning Cycle when Loading Door is open. Interlock relay checks safety circuit for faults each cycle by requiring loading door to open and close to reset. Guard covering switch prevents accidental operation and prevents manual override of switch. STOP: Prominently mounted red Stop Button, immediately shuts down cleaning cycle functions when pressed. WALL MATERIAL: 7 gage and 1/4 inch ASTM graded sheet steel. STRUCTURAL MEMBERS: ASTM A-36 (minimum) structural carbon steel with 3/8 to 1 inch wall box tubing and angle engineered for the load rating of Power Washer with a margin of safety of 3 (min). CABINET WELDING: All seams are continuous MIG welded with E-70 electrode for strength and integrity, and to eliminate cabinet leaks without gaskets or caulking. LEVELING BOLTS: Leveling Bolts located in four corners of base are provided to facilitate leveling of Power Washer without material handling or other equipment. Tie-down anchoring points are provided to secure the washer to the plant floor. DOOR: Ball bearing door pivot points allow for easy door opening and closing with heavy turntable loads. Door position lock holds door firmly in loading position for simple loading. Heavy-duty toggle latch securely locks door shut. Steel to Steel compression seals keep solution and steam inside cabinet without Elastomeric seals that can deteriorate from heat and chemical. The StingRay Quality System conforms to US MIL-Q-9858A standards and complies with the requirements of ISO 9001. The StingRay quality process is an effective and economical quality system. The design of the process is formulated with consideration of the technical and manufacturing aspects of parts washer production, design engineering and materials plus customer expectations and requirements. The process guarantees exceptional quality throughout all StingRay operational areas; including, quoting, design, development, fabrication, welding, mechanical assembly, inspection, testing, maintenance, painting, packaging, shipping, training plus on-site start-up and customer support. All materials and services, both those produced within the StingRay plant and at all outside sources, are controlled at all points necessary to ensure conformance to requirements. The StingRay quality process insures the prevention and recognition of discrepancies and provides for suitable corrective action. Customer representatives are welcome to view tangible evidence of quality conformance at any time. All quality instructions and records are controlled and managed. The authority and responsibility of those in charge of the design, manufacture, testing, and inspection is clearly stated in the StingRay Quality Manual. The StingRay quality process facilitates the determination of the effects of quality discrepancies and costs of quality on price. Equipment, facilities and standards such as drawings, engineering changes, measuring equipment and so forth which are necessary for the establishment of the required quality are effectively managed. Effective control of all purchased materials, supplies, and equipment is included in the StingRay quality process. Manufacturing, fabrication and assembly work conducted in the StingRay factory is controlled from top to bottom. Every StingRay parts washer passes through thousands of quality check points. Every StingRay Parts Washer is thoroughly tested in 4 hour inspection process under full power with all systems operational before shipment. During the final inspection all operational parameters are measured and recorded. Before a machine ships it must exceeds 100% of STINGRAY quality requirements. Our quality process produces high-performance heavy-duty parts washers exceeding our users expectations for both quality and reliability. StingRay Parts Washer undergoing final inspection at the factory. Each washer is operated under full power with rust inhibited testing solution. Machine operating parameters are blueprinted for comparisons to readings at user site.